Yoga is the science of liberation for the Soul. It is not only the science of liberation but also is the path to achieve physical and mental health as well as peace of mind. Aphorisms of seer Patanjali teach the path of overall physical, mental and spiritual development for the human beings. 1. 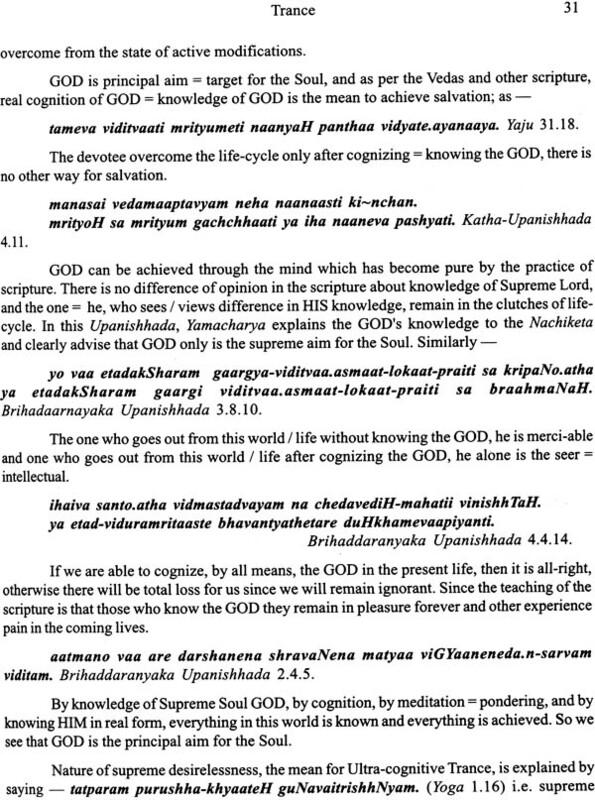 Transliteration of Yoga aphorisms and Vyaasa commentary. 2. 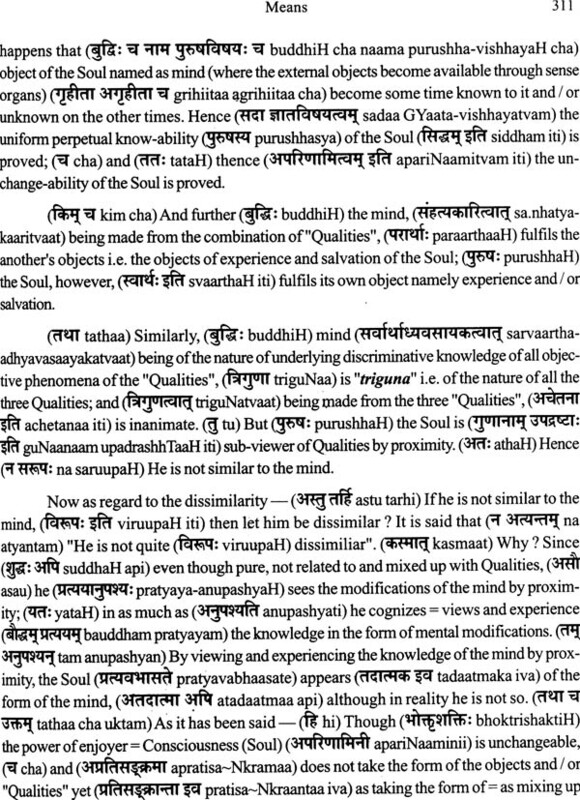 Word-by-word translation of Sanskrit text of Yoga aphorisms and Vyaasa commentary. 3. Supported by the meanings and comments given by Swami Dayanand on various aphorisms in his books. 4. Explanation of Vyaasa commentary, as per inner-testimony of Vyaasa commentary. 5. Vedic commentary on Yoga aphorisms is based on Vyaasa commentary and supported by various testimonies from Vedas and Vedic scriptures. 6. Explanations of attainments are purely on the basis of Vyaasa commentary, and supported by the testimonies of Vedas and Vedic scriptures. 7. Abrogation of misconceptions with regard to various attainments, in order to understand the real form of these attainments. 8. Explanation of Ultra-cognitive Trance with special reference to cognition of Soul and GOD, supported by the testimonies ofVedas and Upanishads. 9. Practical guidance for practioner of Yoga to achieve trance. 10. Detailed step by step guidance for achieving salvation in the last 10 aphorisms, as per inner testimony of Yoga and Vedas and Vedic scriptures. Philosophy of Yoga is the base of comunion with GOD. Seer Patanjali had described the principles of Yoga, which were available in Vedas, for the well-being of Human beings. As per principles of ancient saints, Vedas includes all type of knowledge of world. So the knowledge of Yoga, which helps the human beings to move on the path of realization of self and GOD, was also given by the GOD in Vedas. Commentators from S.No 1 to 3 had written their commentaries in Sanskrit, and from S. No 4 to 10 had written commentary in Hindi. In addition to above, writer of this book had written commentary on Yoga aphorisms in Hindi also. This work is the translation of our Hindi version. Apart from the above, many have written explanations on Yoga aphorisms without giving Vyaasa commentary. Dr. Rama Prashad had also translated the work of Vaachaspati Mishra (along with Vyaasa Commentary) in English; and some of the explanation of Yoga aphorisms in English are also available on intemet; but these are based on one's personal knowledge and understanding of subject without any reference to Vyaasa commentary. 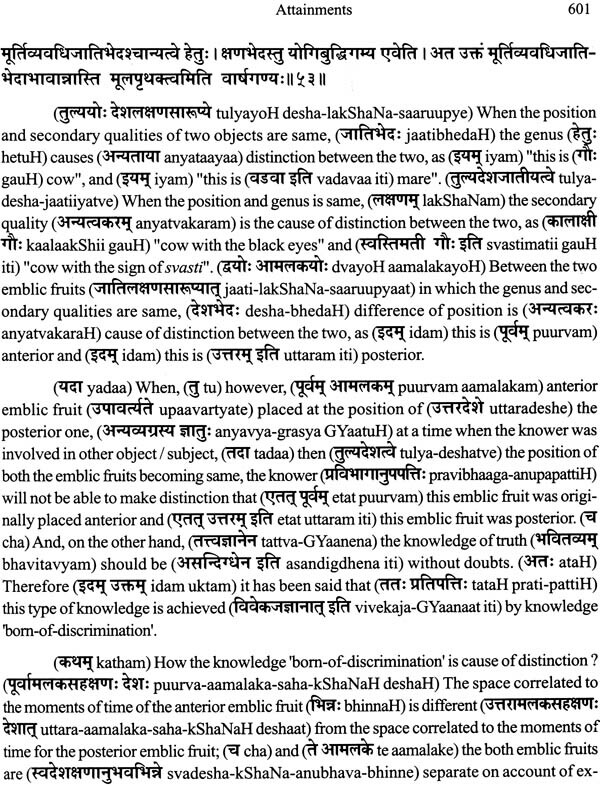 Some of the explainators (from S.No 1-6 above) while writing on Vyaasa commentary, had explained the Yoga philosophy in the light of Puranas, which are said to be written by seer JYaasa. These explainators had included many concepts which were not there in the Vedic Scriptures, but were available in Puranas. On seeing the contradictions of such conceptions with the Vedic Scriptures, others commentators (from S No 7-10) had declared some parts of Vyaasa commentary as post-age mixtures. On the other hand, Swami Dayanand Saraswati, founder of Arya Samaj, who practiced Yoga principles, had declared the Vyaasa commentary as fully authentic and includes it for study and teaching as one of six authentic philosophies. He had not referred any post-age mixtures = interpolation in Vyaasa commentary. I accept that Vyaasa commentary on Yoga aphorisms is fully authentic. Any explainator who had not understood Vyaasa commentary in true meaning, had declared some of its contexts as post-age mixtures or impossible and even categorised some parts as yet to be proved. In order to understand Yoga Philosophy, Vyaasa commentary is must. Any explanation which does not contain Vyaasa commentary will not be helpful to understand the meanings of Yoga aphorisms in true sense. Philosophy of Yoga, as given by Seer Patanjali is not to be seen as independent scripture, but it is a part of Vedic Scriptures. There is no such principle in it, which is in contradiction with principles of other Vedic seers. Principles given by seer Vyaasa, are neither against principles of Vedas and Vedic Scriptures, nor in contradiction with Vedanta Philosophy (his other work). Hence when seer Vyaasa had declared that Souls are not capable of creation of universe, then how can he advise creation of mind from the atoms of Egoism in aphorism 4.4, as is described by the various commentators? The real meaning of this aphorism is to be seen in this commentary. 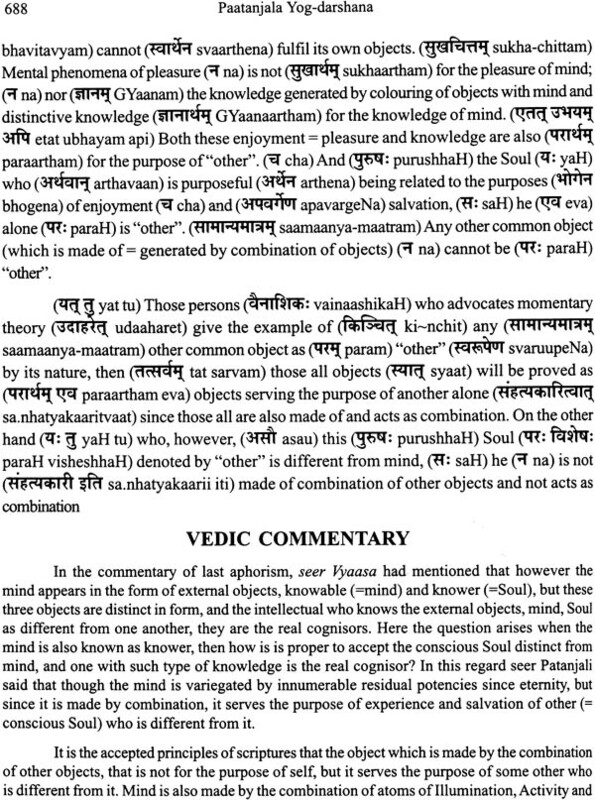 So we have to understand the Vyaasa commentary with reference to total Vedic Scriptures. I have tried to adhere to this principle in this commentary. 2. By giving logic and showing contradictions with the principles explained in other Vedic Scriptures. Merely on the basis of logic, any principle explained by our ancient seers cannot be denied, nor can be said as post-age mixture. It is quite possible that we are not able to understand such principles, as explained by our ancient seers, due to lack of our knowledge or ignorance. If anything, given in Vedic scriptures, is proved wrong on the basis of first principle as above, then it will be acceptable, since there is no need of any other proof, as Vedas are the final authority; if any contradiction is proved on the basis of second principle as above, then also it will be acceptable; but such denials, merely on the basis of logic are not acceptable in Vedic scriptures. In the same way, explanations given by various commentators on Vyaasa commentary are against the inner-testimony of seer Vyaasa. 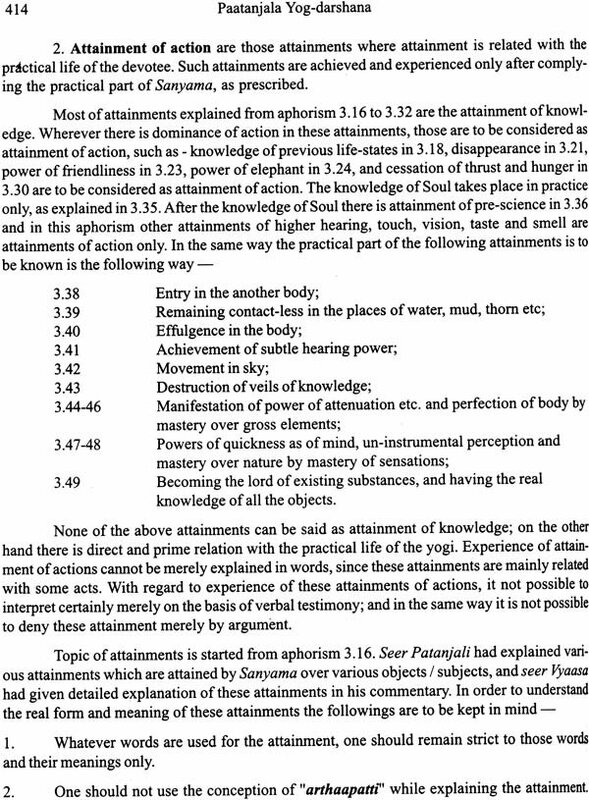 As their explanation of four types of Cognitive Trance, in aphorism 1.17, are in the shadow of Bhoja commentary, and is totally against the inner-testimony of seer Vyaasa, with the result explanation of various other aphorisms had gone wrong. Readers will see the real form of four Cognitive trances, as per the principles of seer Vyaasa, in our Vedic Commentary to aphorism 1.17 in this book. On seeing such type of contradictions, I had decided that Vyaasa commentary which totally authentic, should explained on the basis of testimonies of Vedas, Vedic Scriptures and also in tune with the inner-testimony of Seer Vyaasa. Some of the explainators of Arya Samaj believe that there are post-age mixtures in Vyaasa commentary. 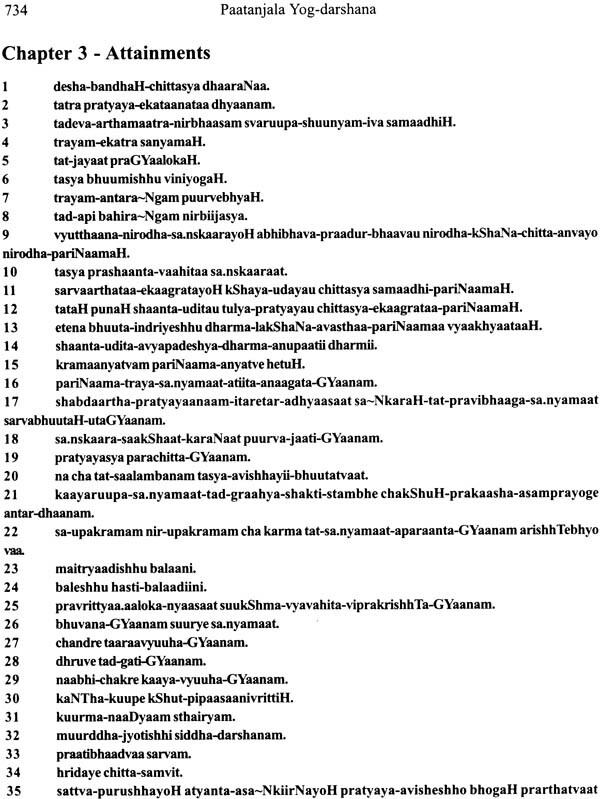 Swami Vijyaanashram had identified 11 places in the Vyaasa commentary as post-age mixtures. These are in aphorisms 1.9, 1.43, 2.5, 2.17, 2.23, 2.28, 3.14, 3.22, 3.26, 3.51, and 4.10. In the same way some others had accepted post-age mixtures in one or other aphorisms. Some explaintors have treated some of attainments as impossible, and some others as partially possible, some are required to be tested, and some are possible in optional way. In this regard I believe that nothing is post-age mixture in the Vyaasa commentary. Various commentators had treated the post-age mixtures on account of availability of wrong history in various Puranas, which are said to be written by seer Vyaasa. If somebody accepts history in Vedas, by merely seeing the various things in this world, named on the basis of various nouns in Vedas that cannot be accepted. Since Vedas were advised by GOD in the heart off our saints in the beginning of this creation; and various things were named on the basis of nouns given in Vedas. It does not mean that Vedas were created / formed by seeing the things and history of human world. So it is not acceptable to attribute the human history in the Vedas which were available before such historical events. In the same way seer Vyaasa have give some examples in his commentary to various aphorisms, and many social references had also been made. 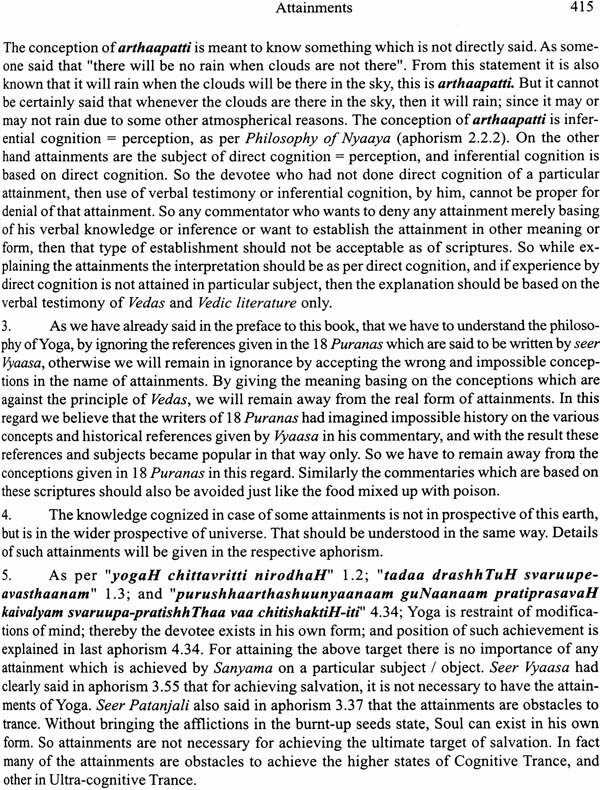 History about those nouns and references is also available in 18 Puranas, and people now relate such history to Vyaasa commentary. As such history does not appear to be logical; various commentators had declared such contexts as post-age mixtures. On the other hand on account of serious contradictions within Puranas and with the principles of Vedas, Swami Dayanand had declared, in chapter 11 of Light of Truth that these Puranas were not written by seer Vyaasa, but some other persons had written these in the name of seer Vyaasa.